Nice One Bedroom & 1 Bath Condominium in town near the Sierra Star Golf Course and the shuttle route to the Eagle Lodge Express Ski Lift Area in Mammoth Lakes. Sleeps up to 4. Ground Floor unit. The Master Bedroom has 1 Queen Bed and there is a separate sleeping alcove between the entrance and the living room with 1 set of Twin Bunk Beds. There is also one queen sofa bed in the living room. You enter the unit from the ground floor and it is all one level. There are 2 outside parking spaces available. Free long distance calling within the U.S. COMPLIMENTARY INTERNET and CABLE TV are provided, however NO REFUNDS will be given for connectivity problems or Internet failure. 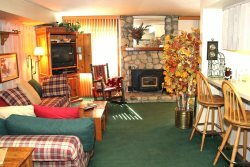 Wifi Internet Access in the unit, Pellet Stove, Surround Sound System, 50" Flat screen TV in living room, 24" Flat screen TV in bedroom, DVD player in both rooms, Balcony overlooks pool area. There is a game room with a billiard table, a ping pong table and a video game in the lobby of the Sunshine Village condos. In the summer you have access to BBQ areas throughout the complex and a Tennis Court near the swimming pool at Sunshine Village. Coin-operated laundry facilities located in the common area near the office. TOT LICENSE 3390-SV175. Timely response, clean, as advertised. We had a great time, thank you! Looking forward to our next visit. Great place to stay! Close to the mountain and restaurants. The house was very clean. We enjoyed our stay at Sunshine Village. It was nice and clean. Thank you again for your kindness and help. Look forward to ski and fishing season again! Wonderful place! Had a great time. That is so much. Everything was great. Condo was clean and well appointed. We will definitely book with you again.